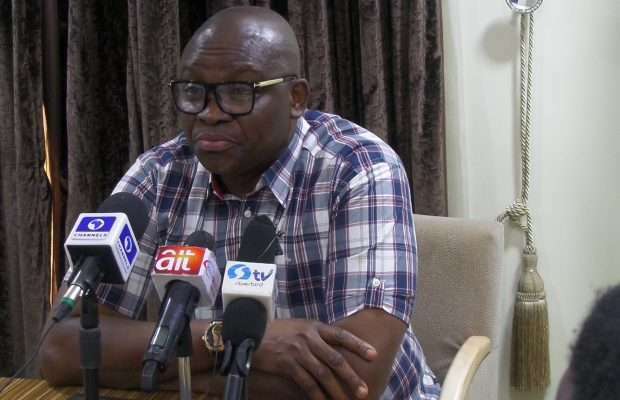 Fulani Herdsmen, under the aegis of Miyetti Allah Cattle Breeders Association, on Monday threatened to institute legal action against the Ekiti State governor, Ayodele Fayose, for making disparaging and uncomplimentary statements on President Mohammed Buhari’s health. The National Coordinator of the body, Alhaji Garus Gololo, who disclosed this at a news conference in Makurdi, asked Fayose to immediately tender an unreserved apology to all Nigerians and Buhari, otherwise, Fulani herdsmen would take legal action against him. Gololo said that Fayose abandoned his constitutional duty of providing good governance to his people, which he was elected for, to attack Buhari while on a hospital bed. He said, “We MACBA have met at our level here and resolved that the Ekiti State governor should publicly apologise to Nigeria’s President who he had mocked and made several comments he is not morally and professionally supposed to. “We know that while other Nigerians were praying for PMB quick recovery, Fayose was praying for Mr. President to die. He even went ahead asking people to begin to address him as the next president of Nigeria while Buhari is still alive, but thank God, Buhari did not die. He maintained that those who said Buhari is dead have seen him alive addressing Nigerians. The coordinator welcomed the President back home and reminded him of the need to be focused on the fight against corruption and securing Nigeria from those he described as enemies of progress who do not mean well for this country.